A fundamental issue in second language acquisition research and in applied linguistics is the question of how learners acquire a second language. Today it is general knowledge that any second language learning follows certain, theoretically established and empirically supported developmental sequences. Based on Processability Theory (Pienemann 1998 and 2005) one can diagnose current states of individual learners' second language development. Knowing about the path of second language development provides important insights into what learners are ready to acquire in the second language at a given point in time. This can support second language learning both in natural and instructional settings. 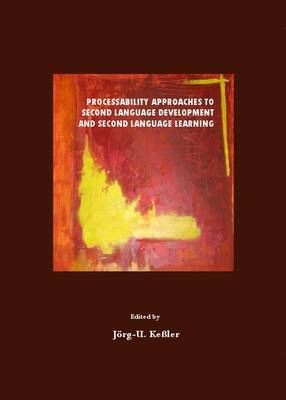 Pienemann's Processability Theory (PT) provides a well researched and empirically substantiated framework to explain the developmental sequences in second language learning across languages. Taking Pienemann (1998 and 2005) as the point of departure the chapters of this book apply, test and extend PT. The book is organised in four parts, (I) Introduction, (II) Current Theoretical Issues within the PT Framework, (III) Applying PT to the Second Language Classroom, and (IV) Work in Progress within the PT Framework.